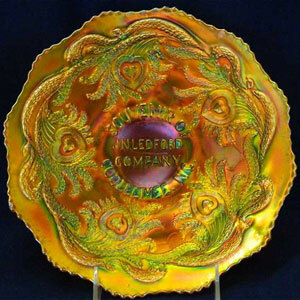 Pattern Description: Heart and Vine plate with "Souvenir of J. N. Ledford Company Couleemee, N.C." in the center. 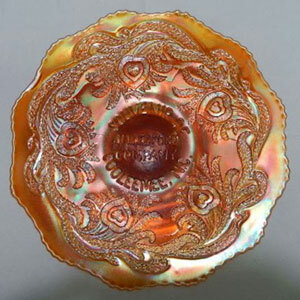 About J. N. Ledford Co.
Fenton's Heart and Vine pattern with 5 hearts wreathed by leafy plumes was used for bowls and plates, but was also the theme for some of the advertising pieces. 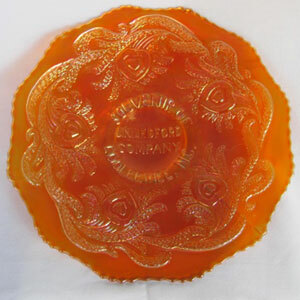 The lettering was placed in the middle (which was typically blank). 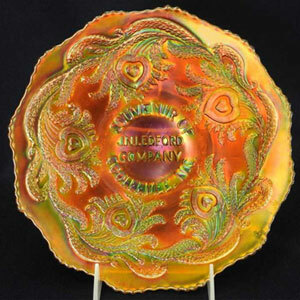 This pattern is only known in a 9″ plate with lettering in the center of the plate reading “Souvenir of J N Ledford Company, Cooleemee N.C.”. It has a plain exterior and a rounded sawtooth edge.